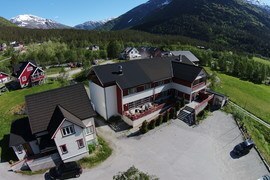 Jostedal Hotel is situated in the idyllic Jostedalen valley, between Jostedalsbreen and Breheimen National Parks. The Hotel is nice and modern with 46 beds and is the perfect start point for your mountain trips, glacier tours, rafting and kayaking trips. We offer single, double, twin and family rooms in addition to two-room apartments with kitchen. 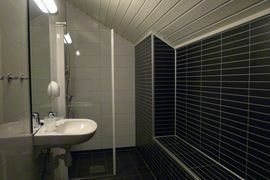 All rooms have a parquet floor, TV and modern bathrooms. We also offer all the requirements for courses and seminars, TV room, free WiFi etc. The hotel is renowned the personal service and the delicious home made food. We offer traditional food and an a’la carte meny, prepared from locally produced food from Gjerde Gard or the region. 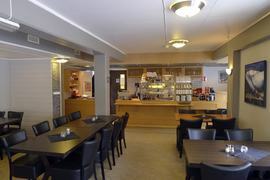 Jostedal Hotel is the natural place to gather after a long day on the glacier or in the mountains. 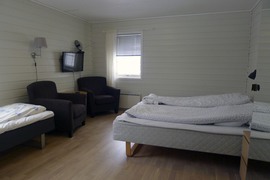 We hope to give you a nice and exciting stay in Jostedalen!